https://openviewgardens.files.wordpress.com/2011/08/the-foolish-gardener.mp3 Listen to Barbara read the post. I stopped growing corn a few years back. For good reason. It takes up precious garden real estate and inevitably gets snatched by some clever critter or other the night before I plan to pick it. Just as people line up for local chicken-pie suppers around here, I swear that corn-lovers of the wildlife persuasion sit in the branches of the copse just beyond my orchard garden, patiently waiting for their tasty corn dinner. And if by some miracle they don’t get it, some much, much smaller pest of the wormy sort likely will. With so many competing for that corn, not all of us…i.e. me…will be smart enough to get any. It’s such a simple lesson. One I learned years ago as a young gardener. And yet, this past winter, when I was ordering seeds, my memory must have dimmed, or my hankering after that elusive corn flavor of childhood dreams must have trumped my better sense, for out in the experimental section of the orchard garden, between the quinoa and the sunflowers, is a stand of corn. 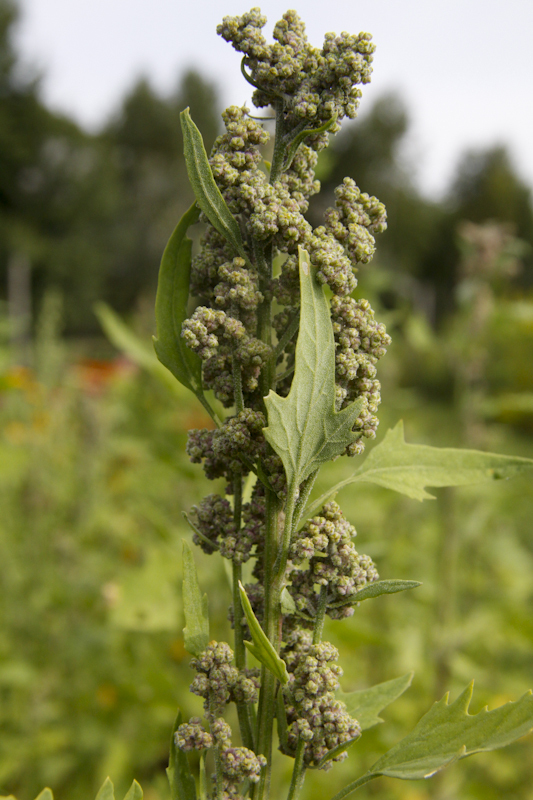 When my ever-sensible husband asked me if I had lost my mind, not about planting quinoa, which should rightfully grow at about 10,000 feet in the Andes, but about trying corn…again… I looked at him as though I had no idea what he was talking about. And as the summer weeks rolled by, I was duped by the stalks growing tall and strong and tasseled in spite of a cold, wet spring. No problem, I assured myself. It’s a cinch. Bill has no sense of the possible. After all, he also thinks I should stop growing winter squash because it runs all over the paths he’s trying to mow and rarely produces more than a few fruits per mile-long vine. I don’t listen. I always grow squash. I like its wanderlust, its shapes and colors, the way its fruits store well deep into winter. So what if there’s only a dozen or so in the storage room. Paths are over-rated. I’m saving him from all that unnecessary mowing. Anyway, the corn minds its own business, stays right where I plant it, safely within the orchard, and the orchard is fenced. It’s fenced against deer and non under-fence-burrowers or over-fence flyers. In other words, deer. And then only if I remember to close the gate behind me. 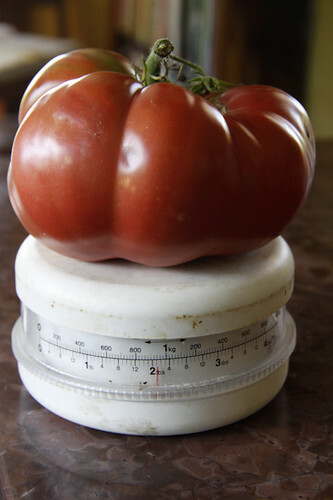 Somehow in the wake of my excitement over the enormous bowl crowned by two-pound heirloom tomatoes I was carrying from the orchard beds, I left the gate open yesterday. Transfixed by the almost appalling size of the marvels I was lugging back to show and share, I made a dumb mistake. And that is the kind of mistake I really don’t like to make. That is the mistake that leads to nowhere but trouble. And sure enough, on today’s morning walk about the place to see how the night treated the garden inhabitants, plant and animal alike, I saw the opening in the fence. And beyond the lavender, beyond the zinnias, just beyond the patch of miraculous quinoa maturing beautifully in spite of early-season struggles to germinate and to survive my weeding hand, I spied the telltale signs of impromptu dining here and there among the corn rows. 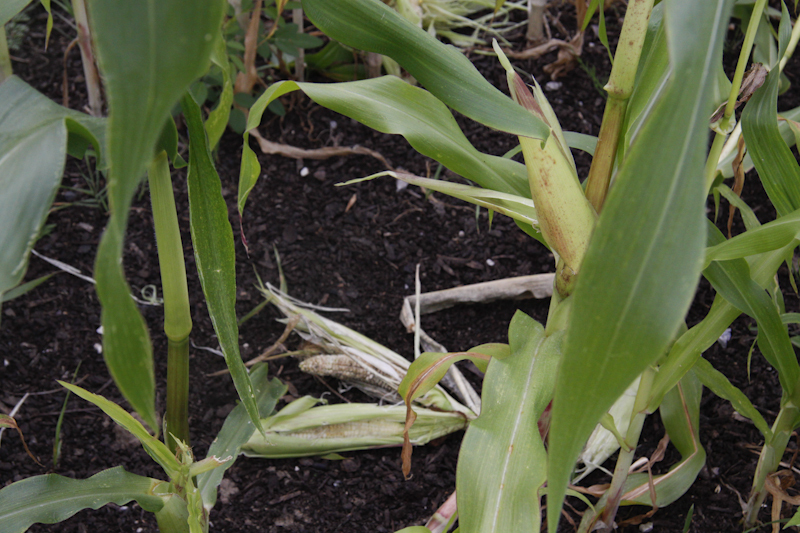 Only the ripe ears had been singled out, their stalks pulled to the ground, shuck and silk parted, kernels stripped. No corn for us. Again. Doh. Bill looks at me with no sympathy. If I want to feed the wildlife, that’s my business, but don’t start complaining. I wouldn’t mind so much if the visitor(s) hadn’t also broken a primary branch of a young peach tree nearby. That’s just plain old destructive. Instructive, too. If I should ever plant corn again, I will need to consider what else is around that might be placed in harm’s way when hungry midnight visitors arrive. And how stupid to plant it near so much natural cover. Good lessons no matter what I’m planting. Mid-August is the time for taking stock. Of my gardening gaffs, my successes, my luck and my glorious failures. Which plants have grown well, which not at all, which should I try in a shadier or sunnier spot next year? I am an eager student of the relationships between these plants, these animals, this climate, this earth. And I tinker very little with any of it, using only good compost and a bit of liquid seaweed as fertilizer and never a spray of any sort. I’m interested in what can grow here, when and why, with minimal intervention—how can I add to the variety and health-benefits of our diet without leaving home, without spending a lot of money, without spending all day in the garden. When I taught writing at MUHS and then at the college, I would tell my students that if they didn’t make mistakes, if they didn’t reach for glorious failures, stretching to do more than they thought they could, they wouldn’t make much progress. But I also told them to learn about their own weaknesses, their own tendencies to make the same foolish mistakes over and over again. To evaluate their own work with a clear eye. We can all be a little slow to learn some of the most obvious lessons. I’ve once again shown myself to be master of the dumb gardening mistake. But I’m determined to learn. Hey, it’s not too late. Come Saturday, you’ll not find me trying to rig up ways to keep turkeys, possums, raccoons and company from the corn—they’ll get it no matter what I do—nope, you’ll find me at the Farmers’ Market, buying it from people better able than I to grow it. And I’ll enjoy every last kernel, knowing full well to what lengths those farmers have to go to keep corn lovers at bay. This is a favorite in my house—especially when corn is at its best. It’s about as easy as it gets. 1. Heat to boiling six quarts of water in a large pot. Add 1 tsp salt. 2. Heat a 10-inch sauté pan over medium-low heat, add 1 TB olive oil and then the pancetta and hot peppers. Cook slowly, patiently, stirring until the pancetta starts to crisp. 4. Add the onions, stir with the pancetta for another five minutes, until the onion is translucent and melding its flavors with the meat. 5. Meanwhile, cook the pasta al dente. 6. When the onion is soft and translucent, add the garlic, corn, lemon zest and tomatoes to the pan and cook for another three minutes, careful not to burn the garlic. 7. Take the corn-pancetta mixture off the heat and mix in the basil. 8. Put the ricotta in a small bowl and add a couple of spoonfuls of pasta cooking water (when the pasta is almost ready) to the ricotta and whisk until creamy and smooth. Add to the corn-pancetta mixture and mix in thoroughly but gently. Add the grated cheese as well. 9. Lift the pasta when it is done, with tongs, and place it right in the pancetta pan. Place the pan on high heat for a minute and toss to mix. Add a few drops of balsamic vinegar to sharpen the flavors, if you like. Serve! I riff on this “add corn” idea all summer when the corn is in. Why just have corn as corn only? Last night I did a quick cod green curry (cod, green onions, ginger, garlic, six chopped up green beans from the garden due to some of my own garden disasters) and added three ears of scraped corn. Divine. Last week the palak paneer got corn in with that wonderful spinach. Isn’t corn just the best for adding a little something to a recipe? Just last night I threw in two ears’ worth of scrapings into my smooth yellow gazpacho (also threw in a half an avocado and a couple of hot peppers hanging about the windowsill) and the soup was a big hit. Now I’m going to rewrite the recipe to include corn as a basic must-do! These all sound delicious!!! But I sympathize with Barbara wanting to grow her own…. and losing it yet again to the deer…. I have a chipmunk in the house right now looking for more cherry tomatoes! Ha, Kate–a chipmunk in your house stealing cherry tomatoes? Last year it was a squirrel raiding the larder (and dragging pizza about your garden) as I recall. Our chipmunks stick to the gooseberries and pears and nuts. No tomato thieves of the furry sort around here. And yes, I will probably try corn again next year…but don’t tell Bill! Oh no, Barbara! How maddening… and how impressive your ability to reflect, then go beyond. Growing food grounds us in the relationships between earth and nourishment; preparing food brings us into relationship with our culture and community; sharing meals brings us into close contact with those gathered at the table with us. What better way to build healthy inclusive communities than through growing locally and cooking globally? Check out our workshops, subscription series of menus, recipes, and goods from garden & kitchen!